Most readers of Daruma are aware that the Japanese have a penchant for taking wrapping to extremes. Forget about a cheap baguette leaving a bakery's premises unadorned — such exposure might rock society. Even a several-meter-long plastic laundry pole gets methodically bundled up just to cross the street! To some foreigners this custom represents a never-ending source of enchantment — and coffee table books — and to others a grave threat to the world’s trees. But the tradition is scarcely waning; today, kitchen refuse still gets handed over to the trash man more creatively wrapped than a Christmas parcel from Tiffany's. On the subject of presents, Japanese need to bear gifts for all manner of occasions throughout the year, and when a special impression is sought, concern for an appropriate wrapper increases exponentially. This requirement for proper presentation is not new, of course. It was just as critical, if not more so, among the Osaka merchant class in the Edo period, and thus it was that the need arose for special ukiyo-e like the one illustrated here. A single sheet actor print by the well-known Osaka artist Gigado Ashiyuki (active 1814-33), this ukiyo-e was almost certainly designed to be folded into thirds. In that form it could serve as a wrapper suitable for exchanges of money or letters, or fan paraphernalia, between fellow kabuki-enamored townsmen. The top and bottom portions depict Arashi Kitsusaburo II, a very popular actor, active in Osaka (with a couple of name changes) from 1822-37. 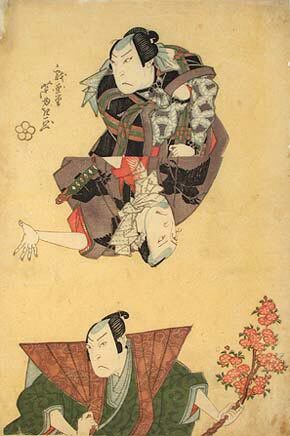 The upside down middle section features Nakamura Utaemon III (1778-1838), an even more important figure who all but ruled the Osaka kabuki stage on and off for half a century. In all likelihood the proper manner of folding and re-opening the envelope (shades of origami!) resulted in the recipient seeing heavily-lidded Kitsusaburo twice (first the top image, then folded behind it the bottom one), followed by a glimpse of perennial superstar Utaemon when the envelope was turned over. The significance of this particular sequence is unclear. It might reflect the ascendancy of Kitsusaburô over a (temporarily) ailing Utaemon, but it is also possible that there is no deep meaning. In fact, one collector friend argues the print was not meant to become an envelope at all: the three images were supposed to be cut up and inserted as a small stack in a separate woodblock-printed envelope, which is how he found his set. Whatever the case, it is clear from the wear on the key block that novelty prints like this enjoyed great popularity, at least at a certain moment in time. In this manner it becomes clear that the handful of wrapper prints which have been recorded so far, representing three artists and two publishers, all date from c. 1825. There must have been a fad for novelty prints in the mid-twenties, because in the same period we also have battledore-shaped prints, votive plaque prints, hair and clothing cut-out prints, back-stage shenanigans prints and fan-shaped prints — the latter the perfect gift to give a kabuki fan to glue onto a summer fan and fan himself with. A bit later in time, we start seeing wallets and tobacco pouches made out of folded ukiyo-e, yet more wonderful artifacts to delight collectors and social historians alike. See the follow-up article on Folding Wrappers. This article originally appeared in Daruma, no. 35, Summer 2002. Copyrighted © text and pictures reprinted with permission.